Have you heard of the theory that foods that resemble body organs tend to benefit those organs the most? For instance, kidney beans resemble the kidneys and are hence good for them. Avocados are good for the uterus because they look like one. While these claims may or may not be true, one claim that I’d like to believe is true is with respect to foods that look like your brain. Walnuts, broccoli, cauliflower, certain green leafy vegetables, and meat products look so much like the brain. Adding them to your diet enhances your brain power and cognitive abilities. Unbelievable, right? This article will surprise you even more! Read on to find out what foods are good for your brain and why. Note: Ideally, choose organic, non-GMO options to reduce the interference of pesticides and other chemicals that may interfere with the health-enhancing aspects of these foods. English walnuts (Juglans regia L.) are rich in polyunsaturated fatty acids (11 g/cup of omega-3 and 46 g/cup of omega-6 fatty acids) and polyphenolic compounds that reduce the oxidant and inflammatory load on brain cells (1). These work together to improve inter-neuronal signaling, increase neurogenesis, and enhance sequestration (detachment) of insoluble toxic protein aggregates and amyloid plaques (1). Almonds (Amygdalus communis L.) are superfoods for your brain. They are rich in vitamin E, folate, and omega-6 fatty acids (2). 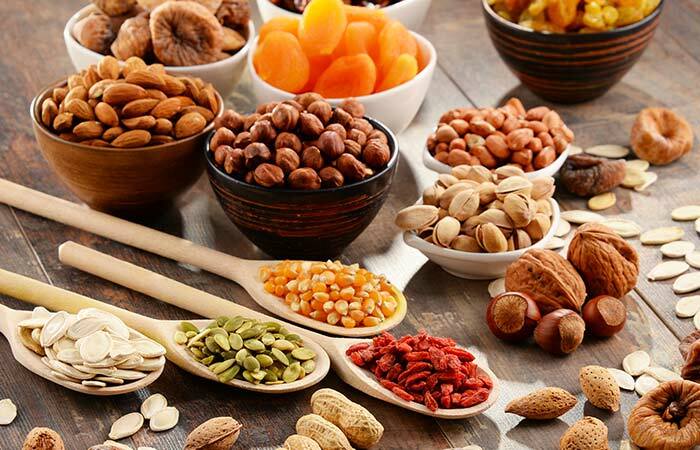 These nuts have anti-atherothrombotic properties because of the abundance of folate. This vitamin prevents the accumulation of homocysteine (sulfur-containing amino acid) in your plasma, which, in turn, leads to the formation of clots in your brain (3). Also, it has been proven that repeated consumption of almonds can improve memory retention and assist in treating amnesia and Alzheimer’s disease (4), (5). Peanuts (Arachis hypogaea) have a high content of niacin and folate and are an excellent source of vitamin E. These nutrients have shown to protect against Alzheimer’s disease and age-related decline in cognitive abilities. In almost 4,000 people who were 65 years or older, niacin from food slowed the rate of cognitive decline (6). Peanuts also contain fair amounts of a polyphenolic compound called resveratrol. It stimulates the biogenesis of mitochondria in the cells. This is beneficial to highly active and energy-consuming cells like the brain cells (7). Eating peanuts can boost resveratrol levels in the body, thereby treating neurodegenerative and neuroinflammatory diseases (7). Whole grains are your brain’s best pals. Oatmeal, quinoa, barley, faro, muesli, brown and wild rice, wheat, and amaranth top the list of brain-friendly foods. As they haven’t undergone milling, whole grains retain most of the nutrients, including fiber, vitamins B and E, and beneficial minerals (8). The fiber and complex carbohydrates unblock clogged blood vessels in your body and brain. Maintaining clear arteries and oxygenated blood flow to the brain help in preventing brain strokes and dementia and restoring cognition (8). This is why they say that your daily meal should contain grains, and at least a quarter of your plate should be whole grains. Plant seeds, like flax seeds, Garcinia kola seeds, and sunflower seeds, are reserves of polyunsaturated fatty acids, vitamin E, and neuroprotective phytochemicals. They are known to protect your brain from nerve death and accelerated memory loss. A diet containing approximately 1 serving of green leafy vegetables per day is associated with slower age-related cognitive decline (9). Spinach, kale, and collards are rich in folate, phylloquinone, nitrate, α-tocopherol, kaempferol, and lutein. The intake of each of these nutrients was positively and signiﬁcantly associated with slower rates of cognitive decline (9). Another plus point of greens is their high potassium content. According to a hypothesis, having a potassium-rich diet can balance the harmful effects of high sodium intake (10). A cup of raw spinach has 167 mg, chopped raw kale has 299 mg, and chopped collards has 61 mg of potassium. Although the hypothesis is not entirely proved, there is no harm in having a cup of greens every day, is there? Cruciferous veggies, including broccoli, cabbage, cauliflower, kohlrabi, turnip-Swede, bok choy, and lettuce, contain a unique biochemical compound called sulforaphane. This glucosinolate by-product exhibits neuroprotective properties via different mechanisms (11). Sulforaphane protects your brain from brain diseases, ischemic strokes, hemorrhages, traumatic brain injuries, Alzheimer’s disease, Parkinson’s disease, and Autism Spectrum disorder. 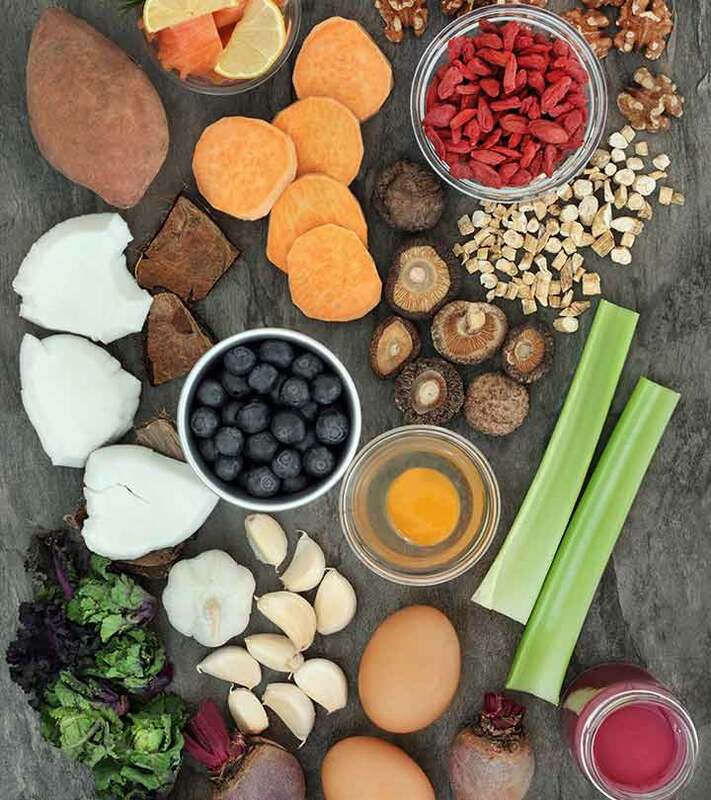 Other phytochemicals and micronutrients work along with sulforaphane to reduce the oxidative stress and inflammation, improve mitochondrial functioning, and activate designated neuroprotective genes to ensure efficient functioning of your brain (11). Beans and legumes are dietary sources of iron, potassium, magnesium, folate, choline, thiamin, and various phytosterols (12). Most bean varieties have abundant amino acids and proteins. These improve insulin sensitivity, which could, in turn, influence cognitive function (13). An oral amino acids mixture was found to significantly improve insulin sensitivity in elderly subjects with sarcopenia or type 2 diabetes. This could probably be due to upregulation and activation of the insulin-receptor synthesis. Insulin activity could, therefore, be enhanced by regularly eating legumes (13). Also, beans contain flavonols that possess antioxidant properties. These phytochemicals help your brain to cope with central fatigue and prevent cognitive decline in the elderly (14). Avocados are fruits – and the richest and healthiest at that! If you are facing exams or need to up your game in problem-solving, binge on some guacamole and see the difference! Avocados are rich in monounsaturated fats, fiber, lutein, and other bioactives. These make them particularly effective at enriching neural (brain) lutein levels. 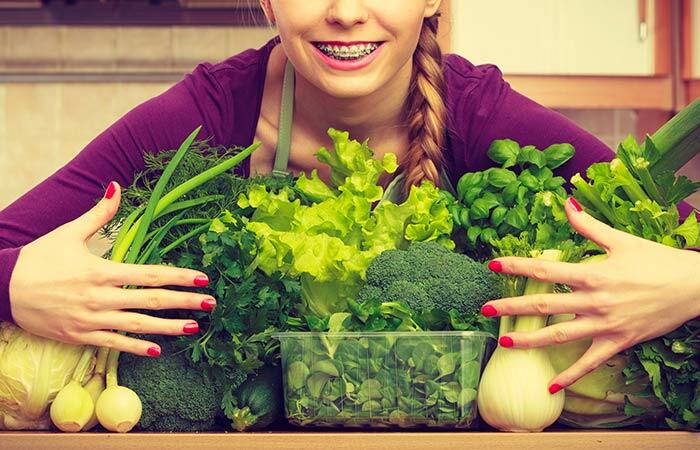 Lutein is a fruit carotenoid that is linked to a positive impact on cognitive and eye health (15). Another study establishes that avocado oil improves brain mitochondrial function in diabetic rats by preventing the impairment of mitochondrial respiration and oxidative stress build-up. Such a regulation maintains reduced ROS (Reactive Oxygen Species, better known as free radicals) levels and might delay the onset of complications, such as diabetic encephalopathy (16). Blackberries, blueberries, raspberries, strawberries, and cherries have phytoconstituents like ellagic acid, chlorogenic acid, kaempferol, gallic acid, secoisolariciresinol, quercetin, cyanidins, pelargonidins, catechins, salicylic acid, fisetin, matairesinol, and pterostilbene. These compounds are top-class antioxidants and anti-inflammatory agents. These berry ingredients can guard against damage caused by reactive oxygen species (ROS) that have a role to play in the progress of neurological conditions like Alzheimer’s disease (17). The anthocyanins, cocoa flavonols, and anthocyanidins enhance cognitive function in young individuals (17). In adults, berries intake yielded working memory improvements, enhanced brain signaling, and reduced depressive symptoms (17). Berries are known to contain high levels of vitamin E – a vitamin known to avert the effects of aging and age-related neurodegeneration (17), (18). These luscious red fruits and their parts are reservoirs of flavonoids that eliminate free radicals and prevent lipid peroxidation. This was proved in several rat studies, where pomegranate extracts decreased body weight and improved lipid serum levels of the rats (19). This resulted in a significant decrease in brain weight and brain oxidative stress. Regular consumption of pomegranate downregulates the levels of malondialdehyde and protein carbonylation (which are markers of oxidative damage) in the brain by 40%-70% (19). Pomegranates are also known for boosting the levels of in-house antioxidant enzymes like superoxide dismutase and glutathione peroxidase. These enzymes also scavenge reactive oxygen species and protect your brain and nervous system from oxidative stress and inflammation (19). Fish are filled with omega-3 fatty acids, vitamins D and B2 (riboflavin), and minerals like calcium, phosphorus, iron, zinc, iodine, magnesium, and potassium. The essential fatty acids, EPA (eicosapentaenoic acid) and DHA (docosahexaenoic acid), are predominantly found in salmon, trout, sardines, herring, canned mackerel, canned light tuna, and oysters. These good fats and micronutrients help in the development and functioning of the brain and nervous system in infants. It is proven that pregnant women can safely consume up to 12 ounces of seafood per week (20). Eating fish may decrease the risk of depression, ADHD, Alzheimer’s disease, and dementia. It is hence advisable to eat fish at least 2 times a week as part of a healthy diet (21). 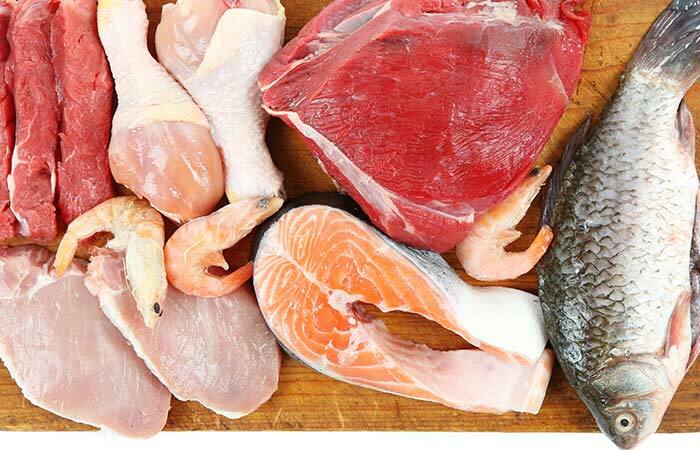 Meats such as kidney, liver, and heart have alpha lipoic acid and other micronutrients that have shown to have a positive impact on cognitive health. Alpha lipoic acid is a coenzyme that has shown to improve memory deficits in animal models of Alzheimer’s disease. It also reduced cognitive decay in a small group of patients with Alzheimer’s disease (22). 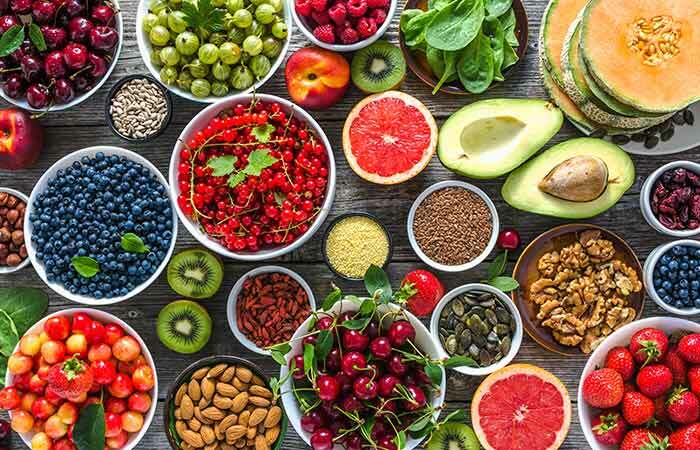 Other vitamins, minerals, and phytochemicals have antioxidant properties and are vital for maintaining energy homeostasis in mitochondria. Particularly, vitamins B3 (nicotinamide), B12 (cobalamins), and A (retinol derivatives) have better bioavailability if they are sourced from red meats. Nicotinamide is pivotal for the electron transport chain (ETC). The molecule NAD (Nicotinamide adenine dinucleotide) is involved in energy production and efficient functioning of your brain and improves chances of survival in adults (23). Research at the Tufts University states that green tea might protect your brain cells (24). The polyphenols in green tea can promote brain performance and reduce the risk of neurodegenerative disorders. Green tea beverages were associated with increased activity in the dorsolateral prefrontal cortex of the brain – a key area for working-memory processing. One of the primary constituent compounds of green tea, EGCG (epigallocatechin-3-gallate), increased the number of cells associated with neurogenesis. Also, these extracts could block the formation of amyloid plaques that are most often linked to Alzheimer’s disease (24). Caffeine is another well-known ingredient present in green tea. It is one of the most potent brain stimulants and is known to give you an energy surge (25). The neuroprotective properties of coffee – caffeine, to be precise – have been investigated in both human and animal studies. Many reports have described a link between caffeine consumption and a significantly lower risk of developing neurodegenerative diseases, such as Alzheimer’s disease (26). Caffeine has shown to be effective in preventing ß-amyloid production and memory deficits in experimental models of Alzheimer’s disease. Consumption of 3-5 cups/day of coffee at midlife is associated with a decreased risk of dementia and Alzheimer’s disease by about 65% in later life (26). While caffeine seems to prevent or restore memory impairment due to disturbances in brain homeostasis, its cognition-enhancing properties are still a matter of debate. Heavy intake (about 10 cups a day) of coffee has also been linked to sudden deaths in people who suffered from cardiac arrest (26). …and finally, my all-time favorite! 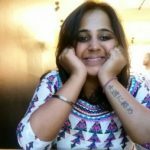 There is a reason you crave for chocolates on days you feel low. 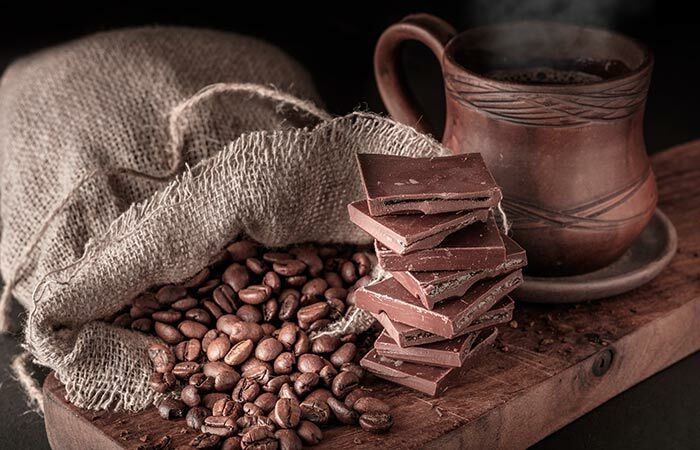 Chocolate may interact with some neurotransmitter systems like dopamine (chocolate contains the dopamine precursor tyrosine), serotonin, and endorphins (present in cocoa and chocolate), which contribute to appetite, reward, and mood regulation. Chocolate contains flavonoids that exert antioxidant effects and protect vulnerable neurons, enhance neuronal function, and stimulate regeneration. But remember, 85% dark chocolate is better than other variants of chocolate. The sugar and milk solids might have several associated risks (27). Cocoa flavonols might also improve the functioning of blood vessels in the brain. 200 mg of cocoa flavanols (=2.5 g high-flavanol cocoa powder or 10 g of high-flavanol dark chocolate) can help maintain the elasticity of blood vessels, contributing to normal blood flow – especially in those with fatigue or sleep deprivation (28). So, making chocolate (dark) or cocoa a part of your diet is not bad after all! Just look at the list of brain-friendly foods! Such tasty ingredients are lined up there, right? But, why do these foods matter to your brain? Or, how can they affect your cognitive abilities? How does your body (and brain) react to these foods? How Do These Foods Affect Your Body? Serotonin is a neurotransmitter that helps regulate sleep and appetite, mediate moods, and inhibit pain. And about 95% of the serotonin is produced in your gastrointestinal tract – which is why the GI tract is lined with a hundred million nerve cells (or neurons). So, in a way, your digestive system not only helps you digest food but also guides your emotions. No wonder they say ‘the gut instinct’ or ‘the gut feeling’ is real! What you should also remember is, the neurotransmitter production is closely influenced by the billions of ‘good’ gut bacteria. They protect the lining of your intestines and provide a strong barrier against toxins and “bad” bacteria. The good gut bacteria prevent cellular inflammation and activate neural pathways that travel directly between the gut and the brain (29). 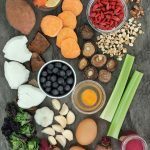 Now, I have a gut feeling that after reading all of this, you will be tempted to include at least 50% of the top 15 brain foods we’ve listed in your diet. If that happens, your exams, assignments, interviews, weekly targets, and memory tests will be a cakewalk. While at it, don’t forget to share your stories, feedback, suggestions, and queries with us in the comments box below. Incredible! These 7 Foods Look Like The Organs They Benefit Most, Did You Notice?